Mentors in Violence Prevention (MVP) is a peer mentoring programme that gives young people the chance to explore and challenge the attitudes, beliefs and cultural norms that underpin gender-based violence, bullying and other forms of violence. 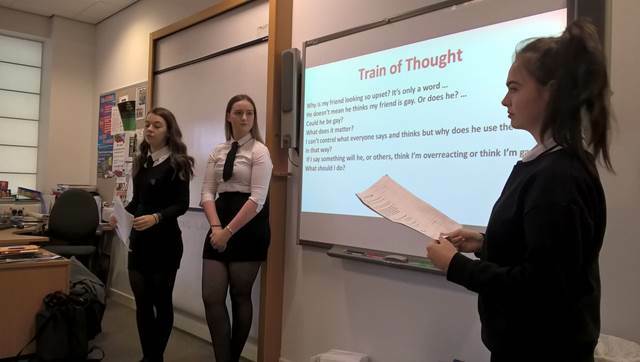 It addresses a range of behaviours including name-calling, sexting, controlling behaviour and harassment, and uses a ‘by-stander’ approach where individuals are not looked on as potential victims or perpetrators but as empowered and active bystanders with the ability to support and challenge their peers in a safe way. The approach encourages community partners such as police, health, psychological services, and community learning and development to work with school staff in the training of mentors and in the embedding of the approach in schools. At Portlethen Academy we currently have over 40 S5 and S6 pupils who are fully trained MVP Mentors who have recently begun getting into classes to deliver lessons to our S1-S3 pupils during PSE.